One of the ADVANCED SERIES of kits, which include factory pre-slotted airframe and through-the-wall fin construction, the SHADOWHAWK is sleek four finned model with a payload section that performs beautifully on a variety of different F and G motors through Level 1 H motors. 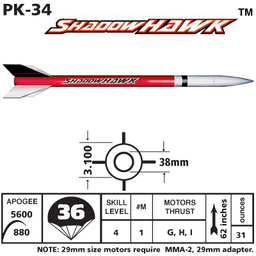 PK-34is our sport scale version of the famous SANDHAWK rocket. Parachute Recovery. Flights to over 5,600 ft.